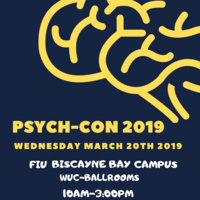 The Psychology Undergraduate Student Careers Conference will be held on Wednesday March 20th 2019, at the FIU Biscayne Bay Campus- WUC Ballrooms from 10 am-3:00 pm. The conference will deliver informative sessions throughout the day and offer students exposure to graduate school and career placement opportunities. See program here.